The Lumia 830 is Nokia's last midrange effort before its entire smartphone business was gobbled up, and rebranded as Microsoft Lumia. Nevertheless, the handset will be updated to the unifying Windows 10 when it lands later this year, so it is far from irrelevant still. One of the thinnest Lumias available, the colorful polycarbonate 830 feels solid in the hand, eschewing the traditional unibody with a replaceable battery design this time. 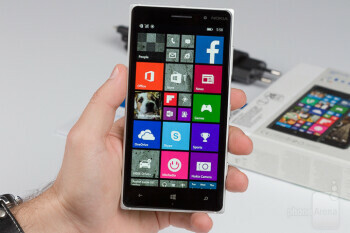 At first brush, the Lumia 830 is the typical Lumia Nokia's been churning out since the brand's inception, with a polycarbonate chassis that is available in numerous flashy colors. Here, however, we don't have the traditional unibody design, but rather an easy to pry off rear cover that reveals a swappable battery pack, as well as the nano SIM and micro SD card slots. We have to take points off for the nano SIM, however, as it will force you to cut or replace your micro SIM card if you buy it unlocked, but this trend is inevitable, it seems. At 5.49 x 2.78 x 0.33 inches (139.4 x 70.7 x 8.5 mm), however, and weighing 5.29 oz (150 g), it is somewhat tall and heavy for a 5-incher, and yet it utilizes a nano SIM slot, which should be reserved for slim and light design efforts. Moving on, the Lumia 830's chassis feels very solid in the hand, the matte polycarbonate on the back prevents it from slipping, and the keys concentrated on the right-hand side, are all big enough, with good tactile feedback, and easy to find and press without looking. We also liked how the tapered cover glass slopes towards the sides to merge with the side rim for one uninterrupted look and feel. Nokia bragged that it takes hundreds of robotic movements to achieve the curved glass edges, and we have to say that the results of all that scrubbing are very pleasant to hold or simply look at. Overall, the Lumia 830 feels like one very solid piece of hardware that should serve you well a long time. While an HD resolution is nothing to write home about in this day and age, Nokia has put a good IPS LCD panel in the 830, with plenty of color modes and manual adjustments to choose from. 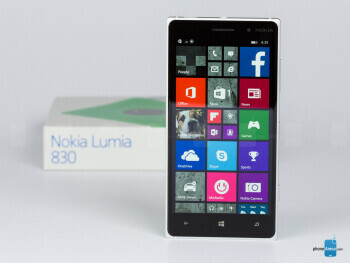 Lumia 830 sports a 5” 720x1080 pixels IPS LCD display with decent 294ppi pixel density. 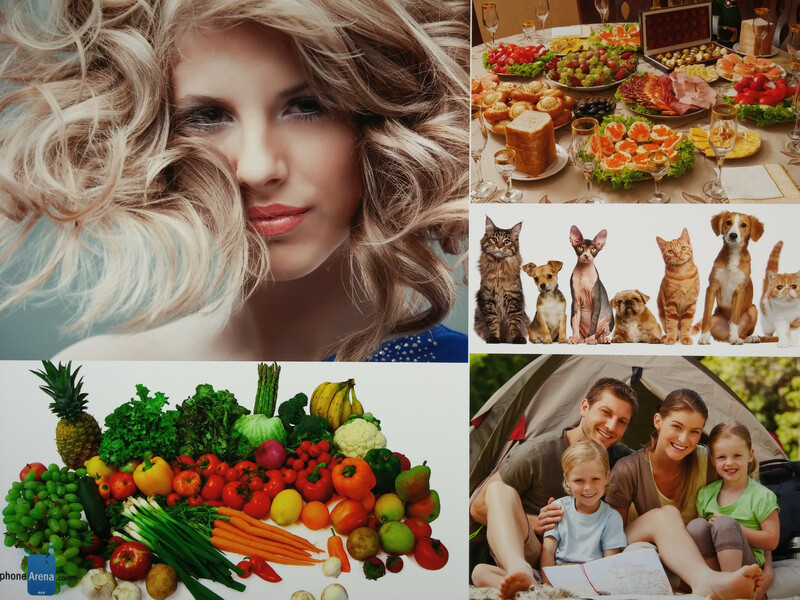 You have several display modes to choose from, like cool, vivid and advanced, with the latter letting you play around with color temperature, tint and saturation sliders, until you've reached the desired results. Color saturation can be adjusted from “natural”, all the way to the gaudy “vivid” level. Color temperature goes from warm through neutral to cold, while the tint slider lets you emphasize individual colors – from green to purple. The color accuracy of the screen in the default mode is excellent, too. Lumia 830 returned 6558 Kelvin white point in our display measurements, which means that the hues are neither too cold nor too warm, but rather cover almost perfectly the reference 6500K mark. Scoring another good point, the color distribution chart returns accurate representation, with no oversaturation or off-kilter tonalities. 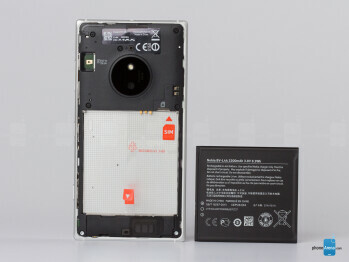 Nokia cites “sunlight readability enhancements” for the Lumia 830, which consist of boosting the display brightness significantly when outdoors under direct sunlight, but doesn't list it as having the Clear Black filter on top that diminishes reflectivity. Thus, while the 830 fares well outdoors, it's contrast is not as good then as the one on the Lumia 930, for instance, so you'd have slightly subpar experience reading the screen under the bright sunlight, compared with the flagship. Still, at 478 nits, the phone's display is bright enough to be used comfortably outdoors. Covered by sculpted Gorilla Glass 3, the Nokia Lumia 830 screen should withstand more than a few bumps and scratches, and, as usual, it also features a supersensitive touch layer, meaning that you can operate it with your gloves on. Windows phone 8.1 is a richer mobile OS now, to which Nokia adds a laundry list of exclusive apps like HERE Maps and MixRadio, and Win 10 is on the horizon. The Lumia 830 sports all the bells and whistles that Microsoft's mobile platform can currently offer, and was already promised to be in line for the upcoming Windows 10 upgrade. Windows phone 8.1 introduced a host of new features including a drag-down notification center (Action Center) that is home to all your notifications, and also to four toggles that you can conveniently use to quickly adjust brightness, switch Wi-Fi on or off, etc (you can customize the function of the four toggles from settings). The brightness toggle is particularly useful, since you can quickly change between low, medium, and high brightness levels without needing to go into settings every time, like before. In the Action Center, you can now also see the actual battery percentage, and the date, which is neat. As for notifications, you can swipe them away one by one to discard them, or you can clear them all in bulk, like the heads-up notifications style that is in Android Lollipop. Windows phone 8.1 has also gotten plenty of new customization options including the capability to finally have a wallpaper (Start Background) on your home screen. Well, kind of, as it is not plastered behind the tiles, like it will be in Windows 10, but rather works as a common tile background. How does it fit with all those Live Tiles? In fact, the wallpaper occupies space from the tiles, and scrolls live with them. A lot of those Live Tiles aren't transparent, and thus do not all show the wallpaper, so it looks a bit like a mosaic, but the achieved effect is still unorthodox. There are lots of other, smaller improvements like the neat Quiet Hours feature. It is a do-not-disturb option in essence, that can automatically activate in certain hours. It also works with the calendar, and when you’re in a meeting, it’d automatically put your phone into silent mode. For the enterprise world, Windows Phones can have their passwords changed and remotely locked, certain functionalities can be restricted, and individual app installation can be allowed or denied on a case by case basis. Basic functionality is - needless to say - well covered. Microsoft bundles in a bunch of useful apps - Travel, Sports, Finance, Food & Drinks and News are here, while Nokia also adds value with a rich Weather app. You have a rich phonebook, and the keyboard experience is one of the best out there with well-spaced keys and a reassuring clicky sounds when you type. 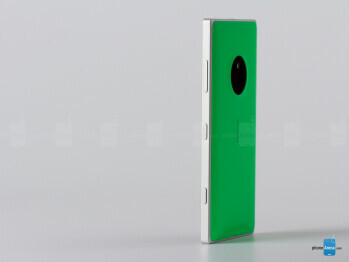 On the other hand, you have Nokia Cyan, a host of improvements to Windows phone exclusive to Nokia. Those include apps like the Nokia Camera, Creative Studio and Storyteller for all Nokia phones, and a few features like Dolby Surround Sound recording available on select phones. Nokia also supplies the so-called Sensor Core feature with certain Lumias, which lets low-power sensor info trickle into the Health app in the form of a step counter, for instance. Add to these the excellent HERE Maps suite that lets you download whole geographical regions for offline voice-guided navigation, and as far as basics go we can say that Windows phone os only a step below its two main contenders – Android and iOS – in out-of-the-box functionality. When it comes to third party apps, though, that's still another beer – half a million or not, some of the ones you are used to are still missing. It's good that Windows phone is comparatively light on resources, as Lumia 830 carries a lowly Snapdragon 400 chipset, potentially marring game performance. A quad-core Snadpragon 400 chipset clocked at 1.2 GHz only is nothing to get excited about in the Lumia 830. This processor is now at the low-end of Qualcomm's spectrum, and is coupled with 1 GB of RAM only. Windows phone doesn't ask for much in terms of processing power, so the interface runs quite smooth, but heavy 3D games might be a chore, not that there are much in the WP app store. 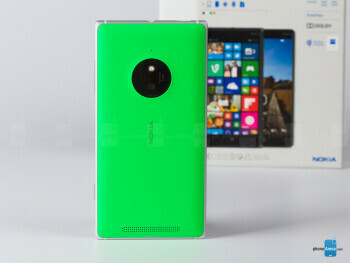 Nokia supplied the handset with 16 GB of internal storage, plus a microSD slot for expansion. Just like iOS, Windows phone doesn't let third party browsers spoil a veritable monopoly. The mobile Internet Explorer 11 browser has been updated in WP 8.1 to be faster and with tons of new features, though. Internet Explorer’s new options include an incognito mode that does not store browser history, reading mode that leaves only the text of a webpage in a nicely formatted document, and support for unlimited tabs. You also get the option to go back and forward in pages by just swiping left and right like on some other mobile browsers we know, which is neat. Another option that is particularly nice is pinning webpages to the start screen. The pages then appear as live tiles showing you the page in its latest, most up-to-date state, serving as a living and breathing bookmark. The browsing experience itself is very smooth, and you can scroll around and zoom in and out of pages without lag. The Lumia 830 supports both a pentaband 4G LTE modem, or speedy 42 Mbps HSPA+ download speeds, depending on the carrier you are on, and its network speed setup. Other connectivity options include Wi-Fi b/g/n, Bluetooth 4.0, A-GPS, DLNA and NFC. 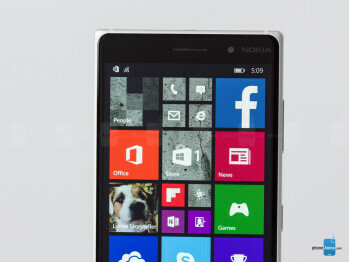 Lumia 830 brings optical image stabilization and Nokia's Rich Recording to a lower price point. The 10 MP PureView rear camera is not what your typical midranger comes equipped with. It sports six-element lens, optical image stabilization, and an LED flash. 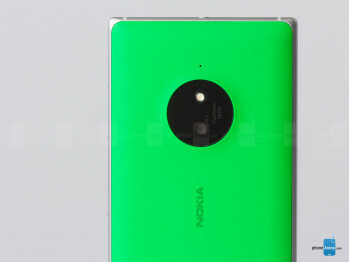 The 1.12 µm pixels are spread on a smallish 1/3.4'' sensor size, and the Lumia 830 has a middle-of-the-road f/2.2 aperture. The 0.9 MP frontal camera is wide-angle, and can record 720p video footage. Nokia pegs the minimal focus range to be about four inches (10cm), which is a pretty good number, though you'd have to enter the separate macro mode to achieve it. The phone comes with a two-stage shutter key on the side, and the shot-to-shot time may take 3-4 seconds, so it's not exactly a camera speed king. The camera app is a bit slow to start, too, especially cold-start, but once it’s loaded, navigating the interface is quick and ergonomic. Nokia Camera has got a very convenient interface, rich in manual controls that don’t get in the way when you don’t need them. There are handy sliders for features like white balance, ISO, shutter speed (up to 4 seconds) and so on. In addition, you get Nokia's mode and effects set like Panorama lens, Nokia Refocus, Bing vision, Cinemagraph lens, and Nokia Glam Me. Outdoors the photos' tonality sometimes leans on the warm, yellowish side a bit too much than it should, given the actual hues in front of the camera. 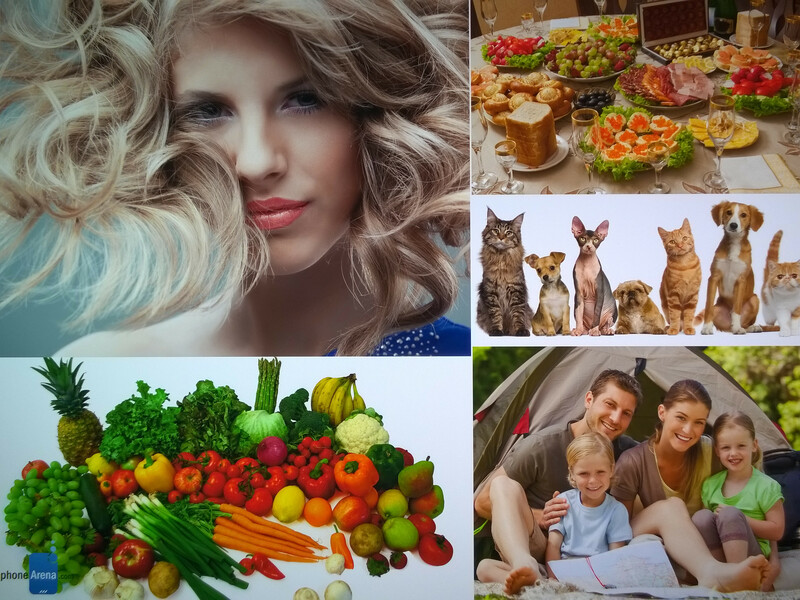 The phone captures plenty of detail, or at least as much as we would expect from the camera's 10 MP resolution. There are no glaring exposure or white balance issues with the Lumia 830's camera, with the shadows highlighted enough even missing an HDR mode, and brighter objects like the sky toned down without overexposure. Indoors the camera returns a rather realistic color presentation, which doesn't lean on the warm or cold side of the spectrum too much. 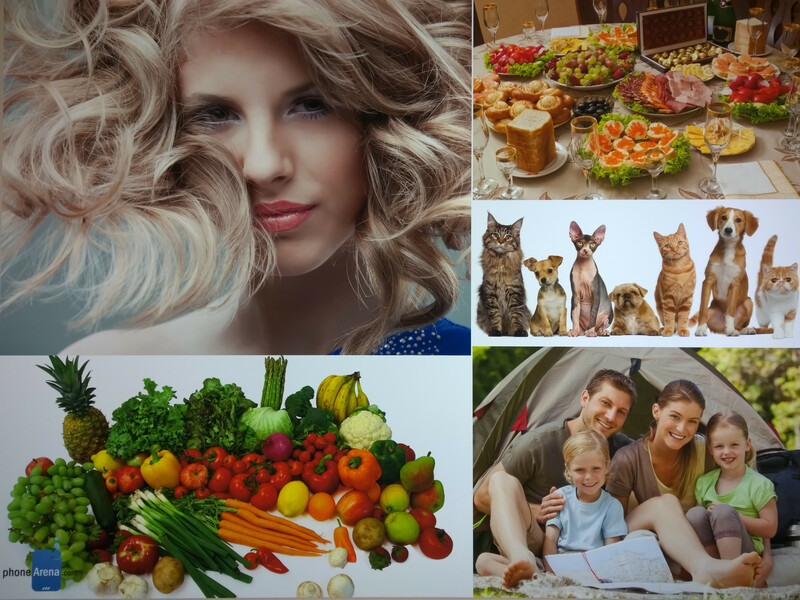 In addition, the photos come out with well-defined objects, and the image is sharp throughout the frame. The Lumia 830 won't fire its flash unless it is pretty dark – like other phones with optical stabilization it uses pretty slow shutter speeds (like 1/15 sec) which often results in blurry image if there is any movement involved from your side, or the objects you are snapping. That's not the only issue with the Lumia 830, though, as the phone didn't fire the usual pre-flash, so our darkness test was ruined, returning only soft, unfocused shots. The handset did spot the scenes when there was at least some light around, but in complete darkness the measurement system sometimes can get fooled. The Lumia 830 can shoot up to 1080p video with fluid 30fps, which runs smooth and uninterrupted by handshake, thanks to the OIS tech that is built in. Details are plenty, and exposure compensation rapid when panning around, but the colors are too warm and saturated to be called accurate, compared to what's actually in front of the lens. Lumia 830 has an ace up its video recording sleeve, though – the sound quality, thanks to the three HAAC microphones is very good. You have a few options – a normal stereo, surround sound (Dolby Digital Plus 5.1), or sound with noise filters applied. We tested all of them, and we'd have to say that the surround option with no filters applied captured the fullest sound range, as can be expected. Nokia's default setting recommends the 100Hz filter, though, which is a good compromise between capturing voices and eliminating background noise. The video player was missing during the MKV lessons, but Nokia's MixRadio will take care of your musical ear for free. With a good 5” display, the Lumia 830 has got the core asset for enjoying media on the go. It is also pretty conducive to pictures and video editing, and the Microsoft-Nokia duo are supplying free apps with rich functionality for both of those undertakings. For music, Nokia’s MixRadio is traditionally a great option for enjoying tunes on the go. It has Spotify-styled on-demand music streaming at a very low price, but you can also use a lot of the functionality for free, with ready-made channels of your favorite artists. In addition, you have Microsoft’s standard Music application with tight integration for the rich Xbox Music catalog, where you can purchase tunes, but the equalizer presets are taken out in the general settings menu, rather than built into the music player's interface. Sound output via the loudspeaker is rather strong with its 79 dB, and sounds pretty decent, too. The stock video player runs MPEG-4/DivX/Xvid files at up to 1080p resolution without a hitch, but the MKV container is a no-go, regardless of the footage resolution. The video player now also has subtitle and captions support. Middling earpiece performance can't be compensated with the three nice HAAC noise-canceling mics. As you can expect from a Nokia phone that has three high amplitude HAAC mics, those we called reported stellar quality in their receiving earpiece, with clean and well-defined voice timbre, generous strength, and suppressed ambient noises. The earpiece of the Lumia 830 itself, however, is not good, as it sounds hollow, and way too muffled for telling out the caller's voice well, or hearing them on a loud street. The 2200 mAh battery flaunts a decent capacity given the phone's specs and price range. 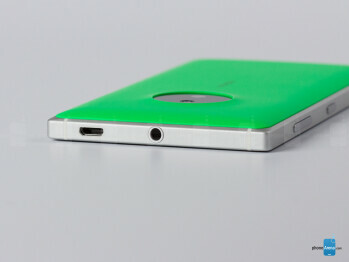 Nokia cites 15 hours of talk time in 3G mode, and more than 20 days on standby. In addition, the screen-on time when browsing or watching videos is pegged at 10 hours, which is a good testament to the phone's longevity. In fact, we measured 9 hours and 19 minutes in our demanding battery benchmark test, which jibes with what Nokia cited for the handset, and is an excellent result. The rear cover also has a built-in Qi wireless charging system. While a very decent Windows phone device, the Nokia Lumia 830 has a steep hill to climb against midrange Androids with its current price bordering on 300 USD or EUR. Windows phone 8.1 is now a better mobile OS, and the Lumia 830 is promised for a Windows 10 update, too. We certainly can't complain about the out-of-the-box software that comes with the handset, but the ecosystem still lacks in terms of app count, so if you are coming from an Android handset, or an iPhone, some applications you know and love might not be there. The biggest advantages of the Lumia 830 against said Androids are the excellent sound recording ability that the three high-amplitude mics bring about, and the color-accurate display. Also, not many phones at that price point come with optical image stabilization for smooth and flawless videos. On the minus side, the earpiece call quality is not that good, flash shots are murky, and the chipset might stall at heavy 3D gaming. At this price point you can find many a formidable Android competitor, like the LG G2 and Huawei's Honor 6 with 1080p displays, faster chipsets, and a lighter build, while a Benjamin more would get you the LG G3 now, for instance. The arrival of Windows 10 might change things for the Lumia 830, but for now, unless you need quality video sound recording on the go, we'd advise to wait for the inevitable price drop.